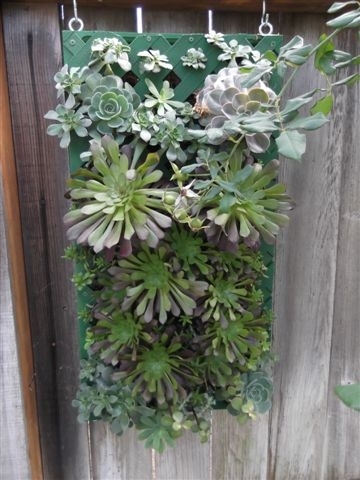 In 2012, the Solano Master Gardeners held a class to make succulent boxes. We brought succulents from home and planted them in pre-made wooded boxes. The boxes had been constructed by volunteer Master Gardeners (or their husbands) who were gifted with building skills. The boxes were 6x6x3.5 inches, had a hardboard backing and ½ inch wire mesh on top. Everyone attending filled their boxes with soil, shared succulents and inserted them into the small spaces in the wire mesh. The group was loud and excited. It was a fun-filled, sharing, learning experience. 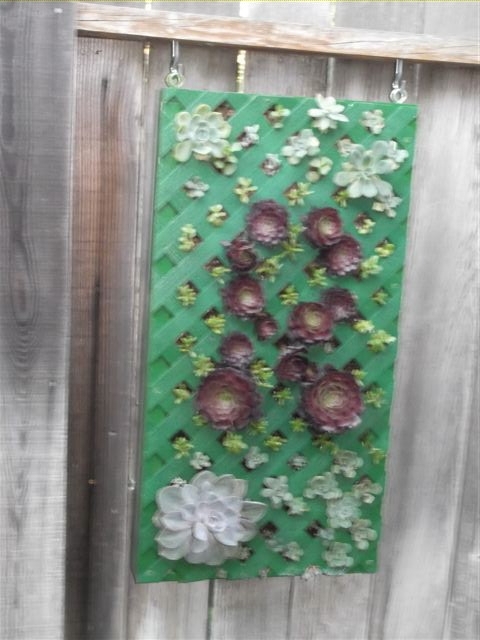 I came home so excited and mentioned to my husband that I wanted to make another succulent box BUT on a grander scale. Being the inventive and frugal person he is, he found a picture frame our neighbor had thrown in the trash, discovered some left over cement board in our garage and a yellowed piece of plastic lathe that was left over from building our patio. 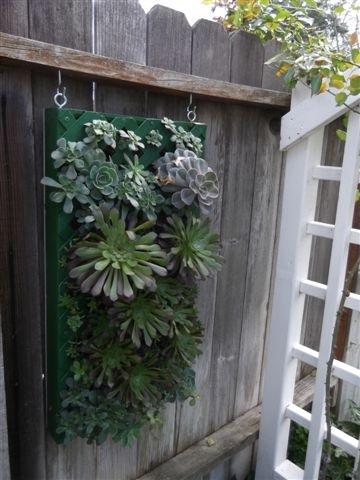 With those materials and a few screws, he created a succulent wall planter, 16x30x3 inches. He spray painted it ‘John Deere’ green so it would blend into the garden. It took awhile to fill each small opening in the lathe with the succulent cuttings I had been snipping from our garden. He placed two eye-hooks on each end of the box and hung it from the fence where two eye-bolts had been placed. This system makes rotating the box simple and keeps the soil inside from ‘slumping’. The first of each month, the box is taken down, placed across the top of our wheel barrow and watered thoroughly. We leave it flat for approximately an hour for the water to saturate the soil. Then it is hung in the opposite direction (using the eye-hooks on the opposite end). This large succulent wall survived the winter with some minor frost damage. I did not cover it or provide protection last winter. This winter I plan to protect it with frost cloth or move the box into the garage. The frost damaged succulents were removed and NOT replaced. The plants not damaged have grown significantly and now cover the empty holes in the lathe. The box has turned into a traveling planter, being a display item at the Dixon May Fair. When it returned home, it was not placed in the initial hanging spot. It presently hangs against the garden cottage wall next to the covered patio. It makes quite a statement as you walk down the brick pathway to enter the backyard garden. Succulents maturing in the box. The final product is pretty nice.